A campaign to reinstate a teacher, who was sacked after he accidentally shot a pupil with a pellet gun during a science lesson, has been launched. Richard West was dismissed from St Peter's Collegiate School in Wolverhampton last week after a disciplinary hearing. Present and former pupils - including the boy who was shot - have called for Mr West to be given his job back. The school confirmed the dismissal but declined to comment further. More than 1,400 people have signed an online petition and a Facebook group called Bring Back Westy 2014 has attracted about 2,000 members. It is believed the incident occurred during a classroom demonstration last November when a pellet ricocheted off a table. The pellet hit a student in the leg but he was uninjured. Speaking to 5 Live's Victoria Derbyshire, former pupil Chris Jones said Mr West was an "inspirational" teacher who didn't deserve to lose his job. "He always made physics fun which sometimes can be a very difficult task," he said. 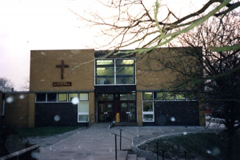 Mr West was suspended from the school while it carried out a joint investigation with Wolverhampton City Council. A school spokeswoman said: "A disciplinary hearing took place last week at which the panel reached its verdict and a teacher was dismissed. "As we are still in the appeal phase of the process, it would be inappropriate to comment any further."